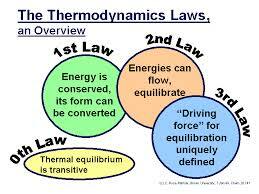 This article briefly Discuss on the Laws of Thermodynamics. The laws of thermodynamics involve the relations between high temperature and mechanical, electrical, and also other forms of energy or work. The laws are valid only when applied to systems in thermal equilibrium rather than for systems at the same time of rapid change or with complicated states regarding transition. A system very nearly in equilibrium continuously is called a reversible system.